An old farming friend once told leading swimming coach Simon Cusack “it’s harder to train your first sheep dog than it is to develop all the others after that”. Like anything, they will always copy the leader. So if Swimming Australia can develop its next crop of rising stars while Cate and Bronte Campbell are still around, it creates a lasting legacy. A legacy containing Olympic Games gold and world records that can be built on to maintain Australia’s status as a force in the pool. Australia’s top female sprinters have converged on the AIS for a week-long 100m freestyle and relay national event camp run by NSW high performance coach Cusack. The Campbell sisters have been joined by Brittany Elmslie, Shayna Jack, and Emma McKeon, as well as three rising stars in Canberra’s Abbey Webb, Natasha Ramsden (NSW) and Eliza King (Queensland). 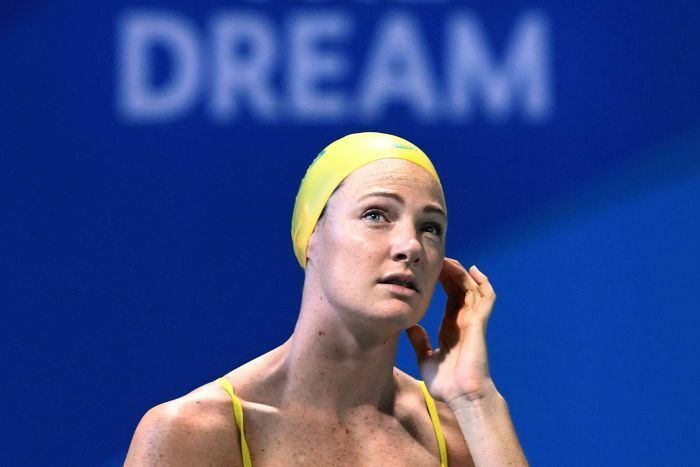 Cate Campbell rebuilt herself after a forgettable Rio campaign to be installed as a member of the Australian Dolphins’ leadership group alongside her sister, Mitch Larkin, Alex Graham and Jess Hansen. It means the prospect of mentoring the next generation for a week in Canberra sits just fine with the 26-year-old. “I am the oldest girl down here, so with age, leadership often comes along. It is really important to foster the young swimmers because I won’t be in the sport forever,” Campbell said. “I will eventually be transitioning out, so you want to make sure you’ve got a good, well-rounded crop of swimmers to fill that space. “I’m really excited for the next 18 months, it’s really motivating knowing you’ve only got 18 months to go until an Olympic Games. We do live in a sport where it is a four-year cycle, and we have world championships later this year, so selection trials for that are in June. Campbell says Australia’s world record-holding quartet need to “keep up with the rest of the world” as the 4x100m freestyle gets faster, but she won’t be putting pressure on herself after the Australian Olympic Committee scrapped medal targets. “I never set myself a medal target, because that is completely outside of my control. What I can control is how I perform in a race,” Campbell said. “That’s what the AOC are doing, it’s empowering athletes, it’s allowing them to take control of their races. If I swim my best ever time, if someone else swims faster than me, I gave everything I could and that doesn’t mean I’m a disappointment or a failure. “What the AOC have done is back athletes to back themselves. They are not looking at unrealistic targets, either too many medals or too few medals.